Last week my local Blick/Utrecht store had a big event. Everything was at least 20% off. They also had a wheel you could spin and win prizes. I think I restrained myself pretty well. 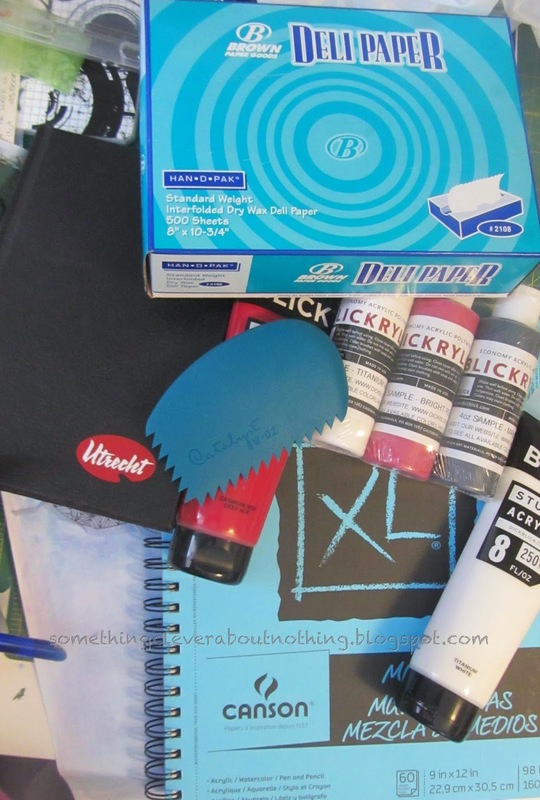 I won the sample set of Blickrylic paints and then purchased everything else. I bought the deli paper from the local grocery store for only $4.50. I'm all set for some serious Gelli printing on paper. but at least I am ready when I find the time! Looks like some serious fun! What fun!!! I wish we had a Blick close by, but probably good on the old wallet that we don't. You did use restraint! Were did you find the deli paper? I am assuming it is by the foil and saran wrap. I have looked at my regular store, but I am going to have to check out some others. Have fun experimenting!! !